Many farms have added another stream of revenue to their operations through farmers markets and agritourism. However, Ontario Orchards in Oswego, NY has created a robust online store selling locally-produced goods with limited retail distribution. At www.ontarioorchards.com, central New Yorkers can get their fix of Grandma Brown’s canned beans and canned split pea soup, Dinosaur Barbecue Sauce, New Hope Mills pancake mixes, Hofmann mustard and hotdogs and other New York-only foods. Or, if they’re in Oswego, they can swing by the farm store to stock up before heading home. “There is always an interest in local brands that stamp a location and a product,” said owner Dennis Ouellette, whose parents, Dennis T. and Estelle Ouellette, founded the farm as a chicken, pig and fruit tree operation in 1952. Today, the younger Dennis Ouellette leverages his location as a way to drum up more sales through shipping local goods. “Depending on your immediate location to resources it can help in many different ways,” he said. He believes that selling local brands builds a stronger customer base, create supply and demand and make his business a niche that forms a one-stop-shop for upstate New York’s local favorite brands. While some farms want to sell only private label items or their own farmstead goods, Ouellette also embraces selling others’ products. Instead of seeing it as competition, he views it as a partnership. “There is a big ‘shop local’ movement and we all profit from providing local brands,” Ouellette said. He admitted that it isn’t always a slam-dunk selling local brands, but standards that have created their own demand bring back customers again and again. Shoppers may feel wary of local but yet unknown brands. Ouellette said that the farm sells little of its produce wholesale — only about five percent — because the profit margin is higher in retail. Although the Ouellettes raise 30 acres of sweet corn, cucumbers, tomatoes, beans, squash, pumpkins, gourds and raspberries, along with 30 acres of Christmas trees and 90 acres of apples in Sterling, they can’t grow everything. They source the rest of their market’s goods from local farms. Dennis and June Ouellette’s adult children, Kathy and Laurie, are also involved in the business. Ouellette credits his daughters with many of the ideas that have made the business successful, such as remaining open year-round. The farm made this change 10 years ago. Creating a year-round agricultural business can be tough in the north. 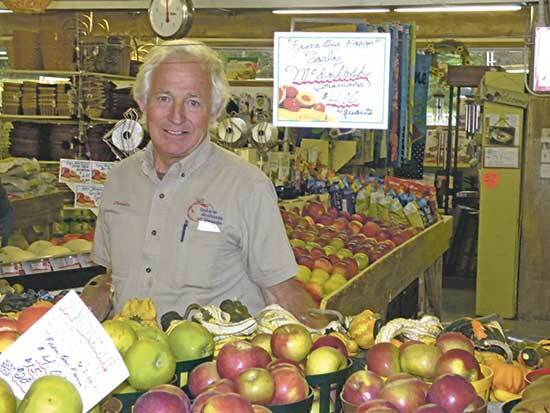 Ontario Orchards achieved it by selling broad range of locally grown seasonal items, such as fruits, vegetables and Christmas trees, and also by opening the market. It sells non-seasonal items like jams, cheeses and baked goods along with other needs like wood pellets, perennials from their greenhouses and nursery, pet foods, canning supplies and basic grocery and sundry items. Ontario Orchard hosts a free two-day Fall Jamboree which includes games, hay rides, magic shows, crafting, face painting, corn maze, U-pick apples and pumpkins, and wine and hard cider tasting. “Agritourism is an exciting part of farming and business,” Ouellette said. He likes the educational aspect of welcoming visitors to the farm so people better understand how agriculture works and the source of their food.